The LANDac project Scaling up women’s land rights in Africa (WLRA) just had its final learning event in Nairobi, Kenya. The 2-day learning event was organized by LANDac (the Netherlands Land Academy), GROOTS Kenya and ActionAid in Kenya, Enda Pronat in Senegal, ADECRU and Forum Mulher in Mozambique, and Oxfam in Malawi. It builds on the LANDac initiative ‘Securing women’s Land Rights in Africa’, a one-year program funded by the Dutch Ministry of Foreign Affairs, that aims to identify, build upon and scale successful practices and experiences of grassroots organizations and movements that work to strengthen women’s access and control over land and natural resources in Africa. To kick-off the event LANDac organized a women’s march with tree-planting ceremony on International Earth Day. The ceremony was attended by the Dutch Ambassador in Kenya Frans Makken, and the entire two-day learning event received a lot of positive and enthusiastic feedback. Check out the trailer of the WLRA learning event in Nairobi on 22 and 23 April 2018 in which grassroots women, traditional and official leaders as well as donors, policymakers and Civil Society Organisations were brought together to discuss how to move the women’s land rights in Africa forward. Or watch the full (15 min) video with highlights of the WLRA learning event. As a follow-up to the Gender Expert Meeting in Apeldoorn (see more details below), the Ministry of Foreign Affairs has awarded funding to LANDac and African partners to build upon and scale successful practices and experiences by grassroots organizations and movements that work toward strengthened land rights for women. Bring together diverse stakeholders Hold multistakeholder Learning Event with diverse participants from regional and local governments, NGOs, farmer organizations, rural women’s leaders, and researchers among others to share research findings, experiences and lessons for advocacy and scaling up. Within this context, opportunities exist for scaling proven approaches, identifying best practices, and providing much-needed evidence to further support the women’s land rights agenda. Nonetheless, achieving equitable land rights for all is a complex challenge which requires a holistic and coordinated approach via a variety of stakeholders, combined with targeted strategies for promoting and strengthening women’s land rights at scale. Toward this end, LANDac and African partners, funded by the Dutch Ministry of Foreign Affairs, are implementing a year-long action research program, Securing Women’s lands rights in Africa: Scaling Impact in Senegal, Kenya, Malawi and Mozambique, or WLRA. As part of the WLRA program, LANDac joined over 40 gender and land rights experts in New York City on July 8 and 9, 2017 for the Expert Group Meeting (EGM) ‘Securing Women’s Land Rights in the SDGs Monitoring Framework: Towards a More Harmonized and Coordinated Global Approach.’ Organized by the Global Land Indicators Initiative (GLII), Huairou Commission, Landesa, Oxfam, and UN Women, the EGM took place prior to the United Nations High Level Political Forum (HLPF) held from July 10 – 19, 2017. The HLPF is an annual intergovernmental meeting focused on the progress and challenges of SDG implementation. The theme of HLPF 2017, Eradicating Poverty and Promoting Prosperity in a Changing World, focused on a selection of SDGs including Goals 1 and 5 which feature the above land-related indicators. The goal of the EGM was to examine these land indicators and find ways to strengthen their responsiveness as well as to promote meaningful, harmonized, and coordinated approaches to monitoring women’s land rights issues at all levels. Activities planned under the WLRA program for 2018 include the presentation of a working paper with GROOTs Kenya and a Master Class at the World Bank Conference on Land and Poverty 2018 in Washington DC. The program also includes plans to organize an event at the 2018 LANDac conference. At the end of January 2016, in preparation for the celebration of International Women’s Day, the Organising Committee of the LG MSD sent out a call for inspiring practical examples of Dutch supported interventions that show how important and catalytic strengthening of land rights for women can be. The resulting publication (which can be downloaded below) comprises examples of various ways in which organisations can assist in strengthening capacity development, documentation and joint catalytic action of women in their rightful claim to improved land governance. At the launch of the publication, it was announced that the stories of Kadaster, Oxfam Novib and Wageningen Centre for Development Innovation were considered outstanding by both the secretariat of the LG MSD Organising Committee and the Taskforce Women’s Rights and Gender Equality of the Ministry of Foreign Affairs. The three organisations were subsequently invited to organise an impactful event that will be geared towards accelerating joint action in strengthening women’s land rights. The Women’s Land Rights expert meeting, which was held from 27th to 29th November 2016 in Apeldoorn, the Netherlands, was the first step of this joint effort. 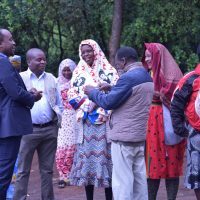 The event was organised by the Gender Resource Facility, Kadaster, the Netherlands Ministry of Foreign Affairs, Oxfam Novib and the Centre for Development Innovation at Wageningen University. You can view a short video about the event here. The purpose of the meeting was to bring together practitioners, scholars, policymakers and representatives of grassroots movements to develop strategies and outcomes that address one crucial question: how to successfully improve and scale up women’s land tenure security and land rights? – To identify and validate what works where. The expert meeting included group discussions for the purpose of collecting ideas and key success factors for scaling of women land rights initiatives, which were also presented during a plenary session. Common ideas and experiences were taken further to define the most promising strategies and the necessary elements needed to enhance the chances of successfully scaling women’s land rights. More information about this is available in the event report (see above).